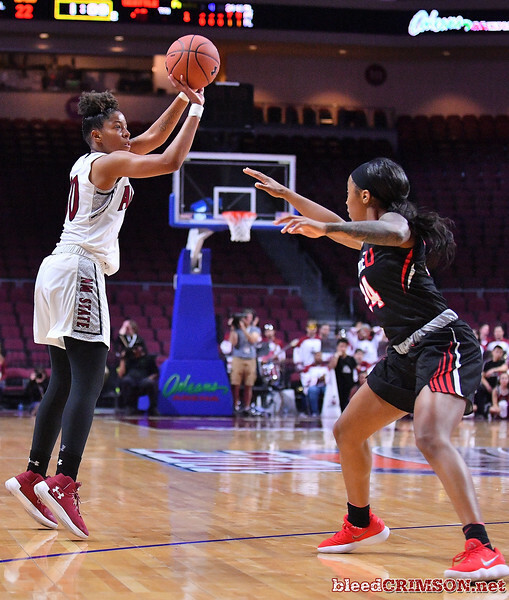 LAS VEGAS, NV - MARCH 09: Jasmine Cooper #1 of the New Mexico State Aggies battles Jacinta Beckley #3 of the Seattle Redhawks for a look ball during a semifinal game of the Western Athletic Conference basketball tournament at the Orleans Arena in Las Vegas, Nevada. Seattle won 84-61. 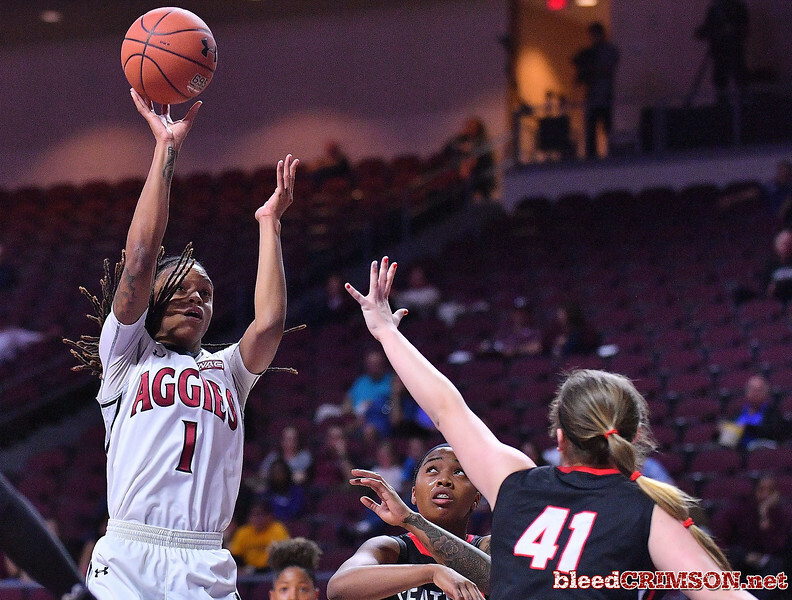 LAS VEGAS, NV - MARCH 09: Jasmine Cooper #1 of the New Mexico State Aggies shoots against Kallin Spiller #41 of the Seattle Redhawks during a semifinal game of the Western Athletic Conference basketball tournament at the Orleans Arena in Las Vegas, Nevada. Seattle won 84-61. 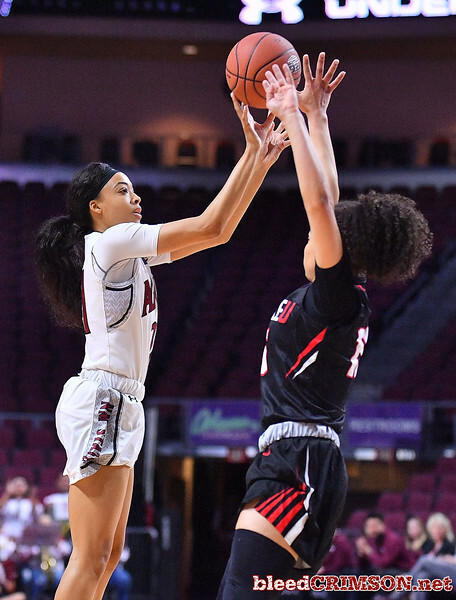 LAS VEGAS, NV - MARCH 09: Brooke Salas #2 of the New Mexico State Aggies shoots against Kamira Sanders #15 of the Seattle Redhawks during a semifinal game of the Western Athletic Conference basketball tournament at the Orleans Arena in Las Vegas, Nevada. Seattle won 84-61. 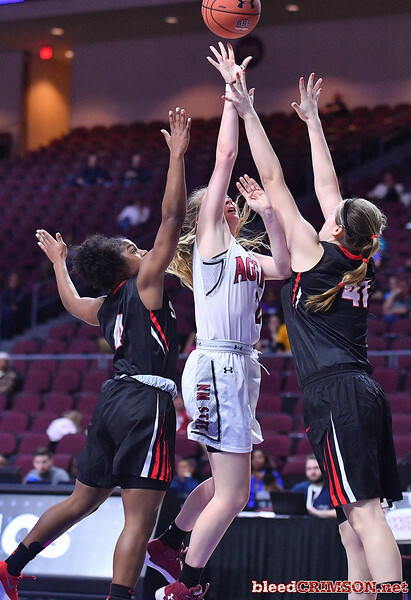 LAS VEGAS, NV - MARCH 09: Gia Pack #30 of the New Mexico State Aggies shoots against Alexis Montgomery #24 of the Seattle Redhawks during a semifinal game of the Western Athletic Conference basketball tournament at the Orleans Arena in Las Vegas, Nevada. Seattle won 84-61. 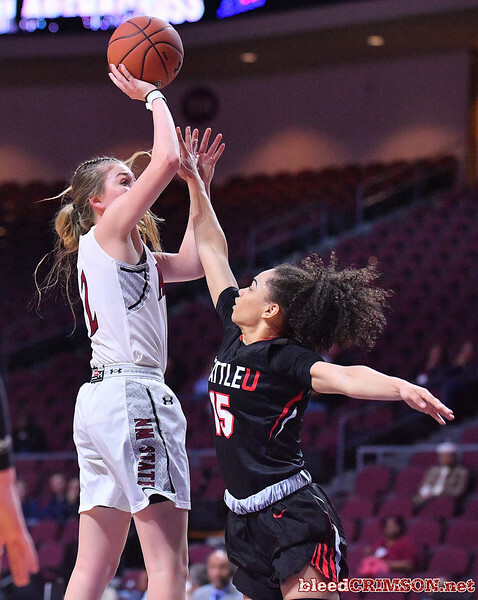 LAS VEGAS, NV - MARCH 09: Brooke Salas #2 of the New Mexico State Aggies] shoots against Kallin Spiller #41 of the Seattle Redhawks during a semifinal game of the Western Athletic Conference basketball tournament at the Orleans Arena in Las Vegas, Nevada. Seattle won 84-61. 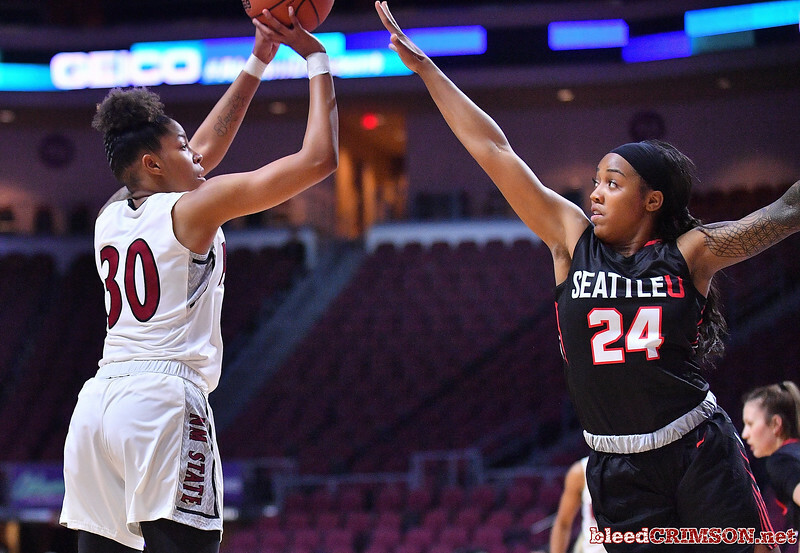 LAS VEGAS, NV - MARCH 09: Monique Mills #21 of the New Mexico State Aggies shoots against Kamira Sanders #15 of the Seattle Redhawks during a semifinal game of the Western Athletic Conference basketball tournament at the Orleans Arena in Las Vegas, Nevada. Seattle won 84-61. 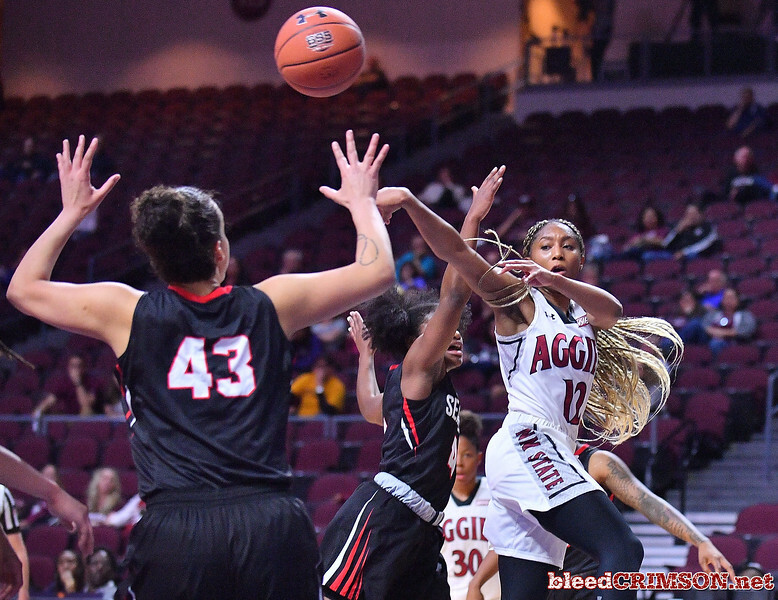 LAS VEGAS, NV - MARCH 09: Zaire Williams #12 of the New Mexico State Aggies passes against Joana Alves #43 of the Seattle Redhawks during a semifinal game of the Western Athletic Conference basketball tournament at the Orleans Arena in Las Vegas, Nevada. Seattle won 84-61. 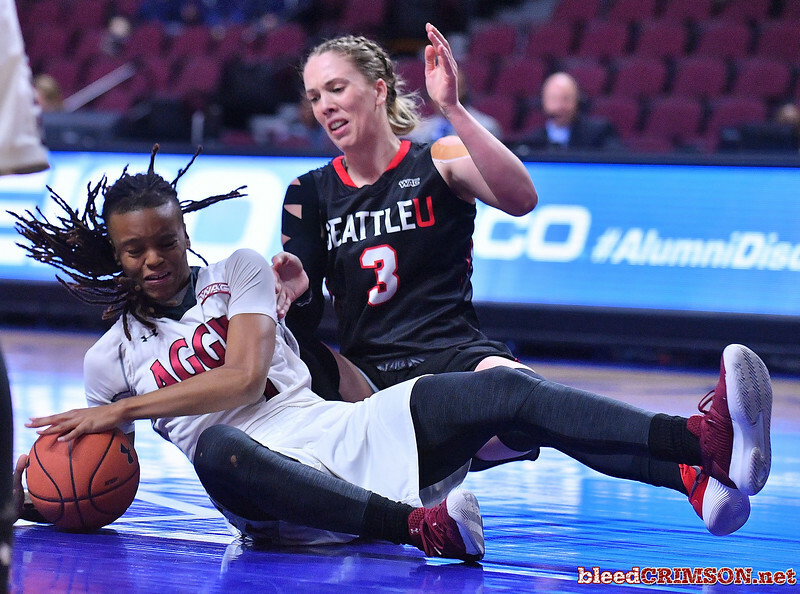 LAS VEGAS, NV - MARCH 09: Jasmine Cooper #1 of the New Mexico State Aggies dribbles against Joana Alves #43 of the Seattle Redhawks during a semifinal game of the Western Athletic Conference basketball tournament at the Orleans Arena in Las Vegas, Nevada. Seattle won 84-61. 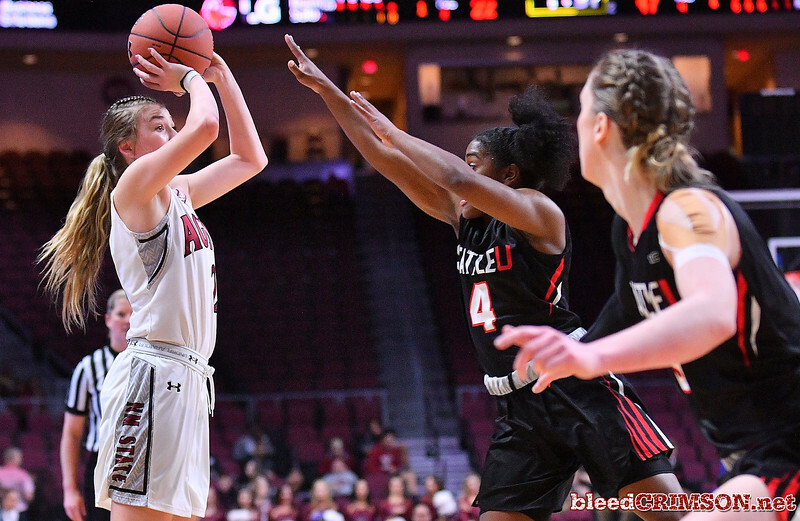 LAS VEGAS, NV - MARCH 09: Jeneva Toilolo #33 of the New Mexico State Aggies shoots against Joana Alves #43 of the Seattle Redhawks during a semifinal game of the Western Athletic Conference basketball tournament at the Orleans Arena in Las Vegas, Nevada. Seattle won 84-61. 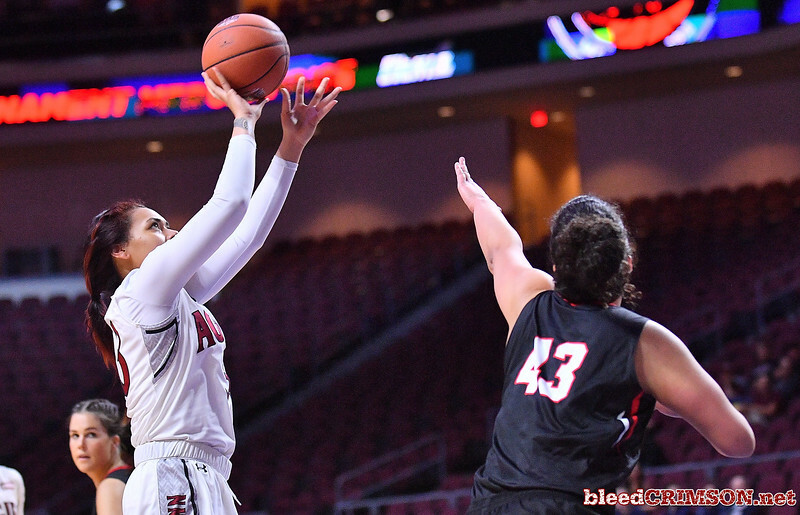 LAS VEGAS, NV - MARCH 09: Brooke Salas #2 of the New Mexico State Aggies shoots against McKenzi Williams #4 of the Seattle Redhawks during a semifinal game of the Western Athletic Conference basketball tournament at the Orleans Arena in Las Vegas, Nevada. Seattle won 84-61. 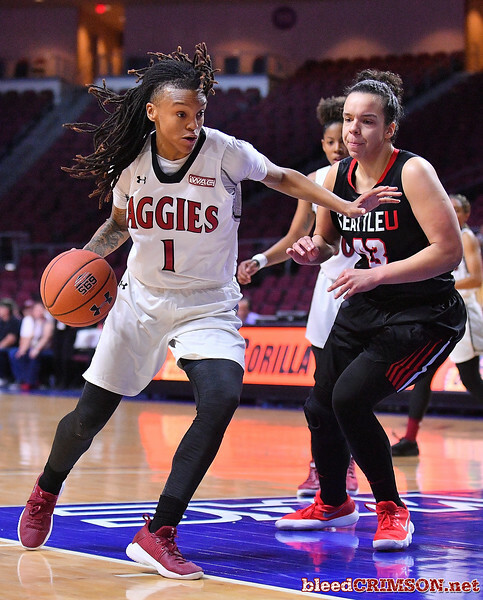 LAS VEGAS, NV - MARCH 09: An New Mexico State Aggies Sundancer performs during the team's semifinal game of the Western Athletic Conference basketball tournament against the Seattle Redhawks at the Orleans Arena in Las Vegas, Nevada. Seattle won 84-61. LAS VEGAS, NV - MARCH 09: New Mexico State Aggies cheerleaders perform during the team's semifinal game of the Western Athletic Conference basketball tournament against the Seattle Redhawks at the Orleans Arena in Las Vegas, Nevada. Seattle won 84-61.